ico - What does the Piccadilly file contain? What does the Piccadilly file contain? The Piccadilly file contains only part of the four volume personal file of the agent, referenced as No.8101: part of volume 2 and volumes 3 and 4 in their entirety. This means that the file is incomplete. It is important to note that the practice in the State Security Service was to keep two types of files for the agents – personal and operational. The personal files contain documents about the agent – investigation, proposal and plan for recruitment, as well as the agent’s declaration for voluntary cooperation. The operational file contains documents connected with the activities of the agent. 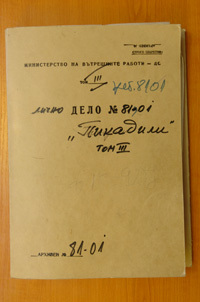 The regulations for maintaining these two types of files were obligatory for the First Main Directorate of the SSS and were based on the most important internal document – the top secret “Instruction for Operational Reporting” approved by the Minister of the Interior, General Dimitar Stoyanov, in November 1976. In the case of Piccadilly there is no trace of what happened to his operational file. Information relating to it can be established from the Piccadilly registration card in the card files of the former FMD, which is archived in the National Intelligence Service, and to which the journalist has had no access. These volumes were destroyed for the reason that they contained old materials, connected with the investigation against the agent relating to economic crimes on the territory of Bulgaria. The proposal for the destruction of operational materials was made by the controlling officer of Piccadilly – Colonel Micho Genkovski, and confirmed by the then director of the FMD, General Vladimir Todorov. Their destruction, however, was not legitimate. In accordance with the Instruction for Operational Reporting of the FMD personal files were to be stored until the agent reached 75 years of age, and operational files were stored for 15 years after they were submitted to the archives. In accordance with para. 15.2 of the Instructions, after the expiry of these two periods, the files had to be submitted for analysis. The analysis was carried out by a specially appointed commission of the “Card registry and Archive”, directorate of the FMD, which determined the historical, academic, informational and educational value of the files. Para. 15.3 indicates that any materials deemed of no value should be described in protocols and proposed for destruction. The protocols drafted by the commission relating to the destruction of files were sent to the operational departments for their opinion, after which they were sent to the Director of the FMD for confirmation. After confirmation of the protocols the files were removed from the archive and any changes recorded in the archive registers, whereupon the files were destroyed in the approved manner. In the case of the Piccadilly file this legal procedure was not adhered to, since there is no record of an analytical commission. The destruction of part of the personal and operational files of Piccadilly was carried out by two people with a personal interest in the case – Colonel Micho Genkovski, Piccadilly’s controlling officer, and the director of FMD, General Vladimir Todorov, who approved the majority of the operational assignment of the agent, as well as related financial expenses. The existing three volumes of the personal file of Piccadilly are not numbered in identical handwriting. Not one of the three volumes has been bound with cord. A compulsory requirement in the SSS was that all the pages in each file in addition to being bound in the normal manner in a single volume should be sewn together with strong cord. Missing also is the standard form which should be glued to the last page over the cord and stamped with the FMD seal. In addition to the five stamps (one of each corner and one in the middle) the form has to contain information about the number of pages in the file, the number and the signature of the operational officer who has submitted the file to the archive. This special procedure was carried out to guarantee the integrity of the contents of the volume and to record any possible unregulated access to the documents. In this case, however, any of the volumes of the Piccadilly file could have been removed with no hindrance or be replaced with any other without any record of who or when. Contains 259 sheets (the authors refers to sheets, rather than pages, since some of the sheets have content on the back). The first 100 sheets have been destroyed and numbering beings at 101. The total number of documents is 111 for the period 1976 – 1981. The volume is not bound with cord or sealed. The description of the contents is written in five different hands. The numbering of the sheets is not identical and is also in different hands. At the beginning of the volume there is a sheet torn from a notebook, which is not numbered. 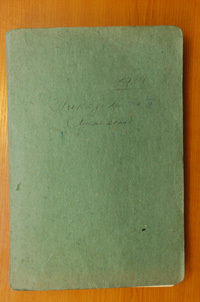 On it there is a handwritten record of Piccadilly’s address in Budapest after his departure from Denmark in 1993. From this it can be deduced that the National Intelligence Service monitored the disappearance of their agent from Denmark after the scandal of his disclosure and were able to make contact with him. Evidence of such contact, however, is not contained within the file. The last document is from 1970, since to volume 2 which contains documents from 1976 – 1981, are appended two documents dating from 1970. They have been preserved from the destroyed volume 1 of the personal file of Piccadilly and are: the handwritten and signed declaration of voluntary cooperation between the SSS and Francesco Gulino, agent Piccadilly, 6th April, 1971 and marked top secret, as well as the top secret “Information about Italian citizen, Francesco Gulino”, 30th November, 1970. Handwritten receipts signed by Piccadilly for money received – 14: 3550 Pounds Sterling; 6500 US Dollars; 18 800 Danish Crona and 260 levs. Contains a total of 288 sheets. The description of the contents includes 129 documents for the period 1981 – 1987, written in two different hands. 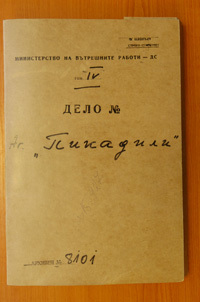 It contains a protocol for the submission of the volume by Micho Genovski to Atanas Kremenliev on the 10th July, 1987. The volume is not bound with cord or sealed. Contains a total of 178 sheets. The description of the contents includes 74 documents, in seven different hands, from 1987 – 1990. The volume contains no indication whether it is from the personal or the operational file of the agent, but the documents chronologically follow volume 3 of the personal file. The sheets are numbered in four different hands. Sheet no. 100 is missing from the file. Some of the sheets also contain a previous number. The volume is not bound with cord or sealed. There is no protocol for its submission to the archive.